Do possums attack cats, dogs, or other pets? Wildlife Removal Advice - Do possums attack cats, dogs, or other pets? Possums are actually more well known for “playing dead” than they are fighting and being vicious, but that’s not to say they won’t be vicious if provoked. They have some seriously sharp teeth, 50 of them to be exact, made up of 12 premolars, 16 molars, 4 canines, and 18 incisors. They’re very much like our teeth - the molars and premolars are flat and blunt, the canines being sharp and pointed, just as you would expect. The incisors of the possum are also sharp and pointed also. A small bite from this little creature would inflict quite a bit of damage - you are being bitten by 50 teeth. The claws are no better either. A possum has five toes, and each toe has a claw. As you can probably imagine, an attack from one of these creatures could be quite painful. Now imagine it were your cat or dog up against this creature. The good news is that possums would much rather play dead than have a full-on fight with your pet. It’s a great trick too, designed to confuse the predator enough so that they let go, enabling the possum to spring back to life and scamper away, as fast as his little paws will carry him. Their whole body goes limp, literally like it has died. It’s a very clever defense mechanism, and one that usually works well enough that the possum doesn’t have to fight at all. Those teeth it has - all 50 of them - they are mostly for show. And for eating, of course. They bare their teeth and growl when another animal gets too close, and that can be enough of a warning. There are times when the playing dead technique might not work, however, and this can often be the case with small children and inquisitive pets. Cats are well known to play with their prey, and if they try to play with the possum even after it has played dead, there’s a good chance it would get attacked by those sharp claws and 50 teeth. The same can be said for dogs, and plenty of other animals also, wild or otherwise. 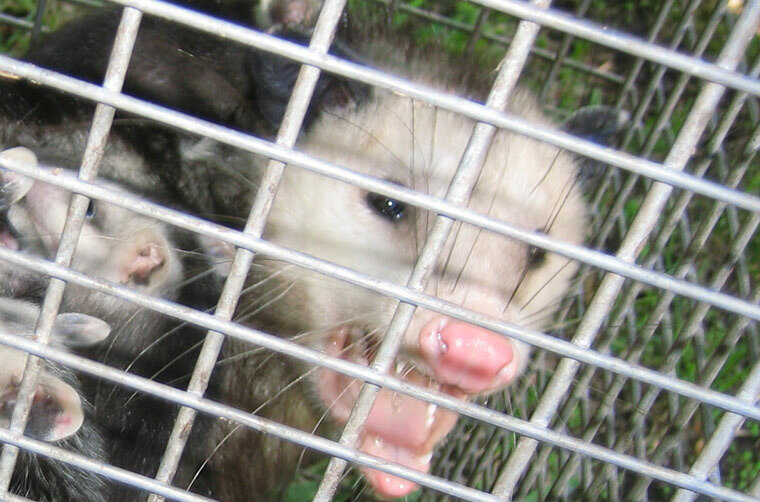 We an answer: Are opossums dangerous to cats, dogs, or other pets? There is generally not a threat of rabies when a possum attacks a cat, dog or human, and it is actually quite rare for diseases to be passed on to humans. Despite this, you’re still not going to want to get too close. The feces and urine they leave behind can transmit disease even if their bodies are not. They have been credited with helping the spread of Lyme disease, however. They have quite a low body temperature, and this means that any diseases passed on to them do not survive on their host. Ticks are well known to carry disease, but they often die when they jump and feed on possums. One less Lyme disease-carrying tick in the world is definitely a good thing. Just imagine how many these possums are killing off for us daily?! How much does opossum removal cost? - get the lowdown on prices. How to get rid of opossums - my main opossum removal info guide. Example opossum trapping photographs - get do-it-yourself ideas. Opossum job blog - learn from great examples of opossum jobs I've done.